Franny, eleven, is enduring, not fire drills, but duck-and-cover drills at school, in the event of an atomic bomb attack. I remember no such drills from my childhood, but Franny lives outside Andrews Air Force Base, Washington DC, which would be a prime target and we’re in the midst of the Cuban Missile Crisis, October 1962, when the U.S.S.R. is threatening to strike the U.S.A. 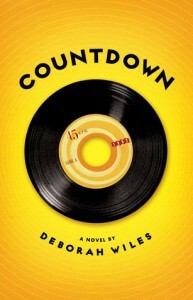 The novel “Countdown” by Deborah Wiles (Scholastic 2010) begins with “documentary footage” of 1962 America. Handsome charismatic John F. Kennedy is quoted as saying, “We have enough missiles to blow you up thirty times over.” Nikita Khrushchev, Head of the U.S.S.R., on the facing page says, “We have enough to blow you up only once, but that will be enough for us.” The world is in the midst of cold war. Who remembers Khrushchev with a witty comeback? Franny’s big sister is attending college in DC and involved in mysterious endeavors to “change the world.” What she’s actually doing remains mysterious. Interspersed throughout the book are more “documentary” pages that give the reader the context of the times. And so much was happening. The Civil Rights Movement was in full swing, for instance. Crazy Uncle Otts tries to build a fallout shelter in the front yard. The nation is frozen in the grips of fear while Franny’s fears are those of a fifth grader—her best friend has chosen another, her adored sister is absent, an odd embarrassing uncle, plus the realization of her world in great change. The documentary pages include advertisements for fallout shelters, lyrics to songs, young Bob Dylan, TV celebrities, the glorious first lady Jackie Kennedy, maps, political cartoons headlines, Havana. This is a very cool format that both kids and adults will appreciate. It gives the context of the times, deepening our understanding of the story. We’re getting the top internet hits delivered just as we need them. This semi-autobiographical documentary novel is the first in Wiles’ trilogy of the 60’s. It was a pleasure meeting you and critiquing with you this weekend. I can’t wait to buy this book and the rest of the series! I always have been intrigued with the 60’s. Thanks for sharing.